Plano, TX (January 24, 2018) – Cinemark Holdings, Inc. (NYSE: CNK), a leader in the motion picture exhibition industry, celebrates the 90th Academy Awards with its annual Oscar Movie Week Program, Feb. 26 – March 4, 2018. 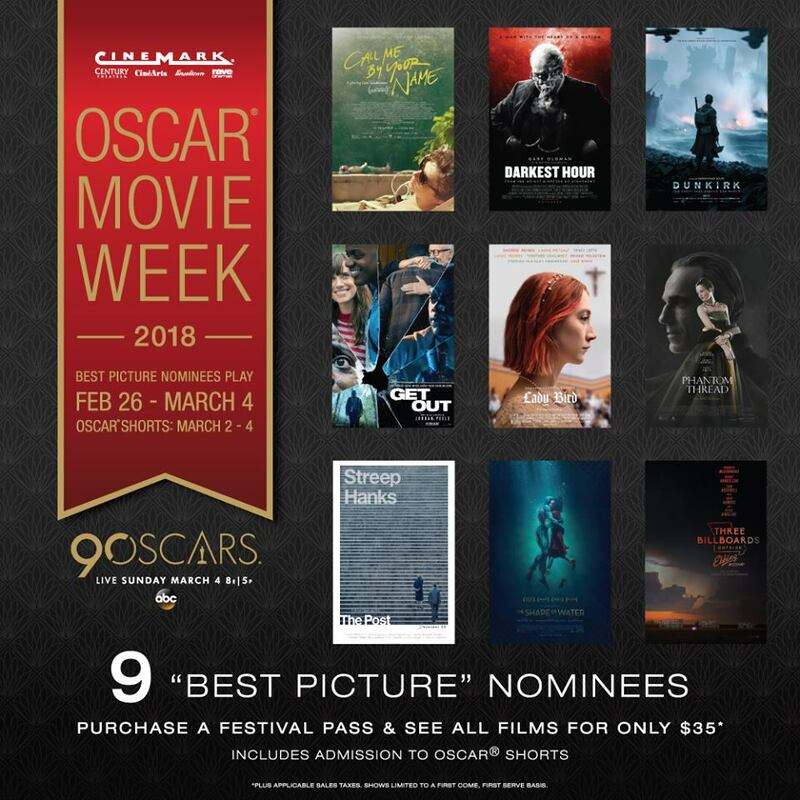 Select Cinemark locations will present all nine Oscar-nominated Best Picture films and all nominated Best Live Action and Animated Shorts during their Oscar Movie Week. Festival passes are on sale now at cinemark.com/Oscar-movie-week. Cinemark’s Oscar Movie Week Program begins Monday, Feb. 26. Guests can purchase Cinemark’s special Festival Pass for $35 and watch all nine films all week. Festival pass holders receive an exclusive offer for 50% off any size popcorn and will be awarded a specially designed keepsake badge and lanyard. Guests can also enjoy the nominees on a single-film basis at regular admission price. Tickets for the Oscar Shorts Program, which include seeing all 10 short films, are only $10 each. Find participating theatres and check show times at cinemark.com/Oscar-movie-week.